The interior of the instrumented NASA DC-8 aircraft as prepared for takeoff. The UHSAS data were collected during ATom deployments. 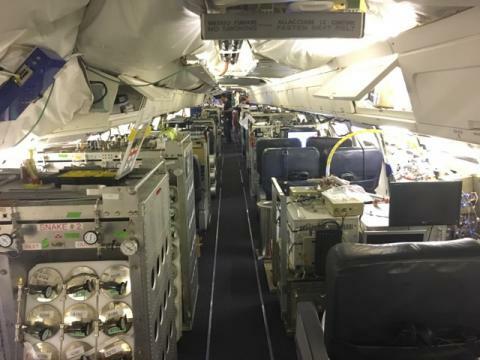 This dataset from the Atmospheric Tomography Mission (ATom) provides extensive calibration and in-flight performance data for two Ultra-High Sensitivity Aerosol Spectrometers (UHSAS) used for particle size distribution and volatility measurements during the first and second ATom airborne campaigns. Data include: UHSAS detection efficiency, sizing calibration, performance at a range of pressures and at a range of thermodenuder temperatures, comparison of UHSAS-2 and condensation particle counter (CPC) particle number concentrations, comparisons of UHSAS-1 and UHSAS-2 for dry particle number concentration, surface area and volume collected onboard of a NASA DC-8 aircraft during August 2016, and dry aerosol size distributions for thermodenuded and non-thermodenuded instrument collected in February 2017. ATom was a NASA Earth Venture Suborbital-2 mission that studied the impact of human-produced air pollution on greenhouse gases and on chemically reactive gases in the atmosphere. See all data from ATom.